She did have her date with Michael at Sardi’s the night before the Jackson 5 concert at Madison Square Garden on June 30, 1972. Andy Warhol: Have you been dating in Hollywood? AW: But you’re so cute. 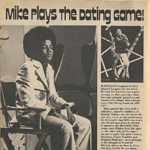 MJ: I’ve never been on a date-outside of The Dating Game. And that was work. Latonya Simmons won a date with much sought-after Michael Jackson when she was 10 years old. The year was 1972: a 14-year-old Michael Jackson is about to make a young girl’s dream come true. 10-year-old Latonya Simmons was competing against two other girls to win a date with the 14-year-old superstar on The Dating Game. INSIDE EDITION spoke to Latonya, a one-time hospital administrator in Los Angeles back in 2003. Latonya recalled going out on four or five innocent dates with Michael, nothing more than a peck on the cheek. “It was just kid stuff, we were kids,” she said. Michael’s love life would become a real-life dating game played out for the world to see. Michael revealed his first love was Tatum O’Neal in 1979. But in 2003, he told 20/20 he spurned Tatum’s sexual advances because he was too shy. In 1984, Michael reportedly dated Brooke Shields. Rare footage shows Michael and Brooke arriving in a Rolls Royce to the 1984 Grammys. Then there was the King of Pop’s marriage to the daughter of the King of Rock and Roll – Lisa Marie Presley. “And they said it wouldn’t last,” said Jackson at the 1994 MTV Video Music Awards. The marriage lasted less than two years. But only one girl can claim the title of Michael’s first love. “I guess I was his first date, yeah,” said Latonya. You are currently browsing the archives for the 1972 Dating Game Latonya Simmons category.